One of the most useful things that our Clients have found using the Query Builder is the ability to run reports on new Members to the Organisation. This allows you to set up a Query that will help you contact or export all Members that have joined your Organisation since a certain date. >1. Within the Management Console, select Members from the top menu, then Query Builder from the left menu. 3. Give your new Query a name, such as New Members Report and then click Save. 4. Click on Build at the top of the page to being building the query. 5. 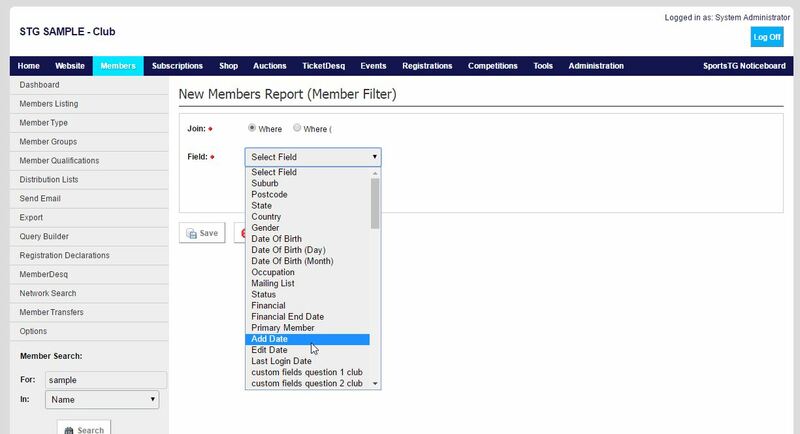 Click on the Add button at the top of the page above Member Filters. 6. Select Where as the join, and then Add Date from the dropdown menu. 7. Select the greater than (>) or greater than or equal to (≥) symbol, depending on your preferred option. 8. Finally, select the date you wish to view Members that have joined after. 9. Click Save, then click Test to test the query. Note: Make sure when you use your Query after the initial build that you update the Date used to ensure you're always pulling the newest list of new members.